James "Blood" Ulmer is a truly original artist. 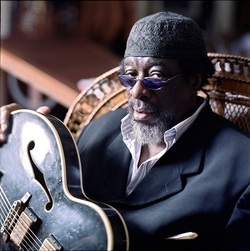 Cited by many as an avant-garde guitarist, he is actually an authentic blues guitarist, drawing upon the full spectrum of African American music, from free jazz, soul, be-bob, avant-garde, and rock. In addition to being a great guitarist, he is a stunning baritone vocal stylist whose lyrics cut into and across his music. He began his career by playing in funk bands in Pittsburgh with stops in Ohio and Detroit before finally arriving in New York City in 1971. In 1973, James recorded with Rashied Ali, and in that same year began working with Ornette Coleman, whose concept affected Ulmer's music thereafter. His blues and rock-tinged art was raw, aggressive, as well as intellectually compelling. In the 1980s, he made three records for Columbia featuring artists like David Murray, Amin Ali, and Ronald Shannon Jackson. “Blood” dug deeply into an investigation of the blues as the century turned. First he recorded Memphis Blood: The Sun Sessions, with guitarist Vernon Reid both performing and producing. In 2003 he issued No Escape From the Blues, recorded at Electric Lady studio. In 2005, Blood released Birthright, on the Hyena label, easily his most intimate recording. His solo recording contains ten originals and two covers of classic repertoire, and takes “Blood's” blues journey to an entirely new level. Today, James “Blood” Ulmer tours a variety of bands, from his solo project to the Odyssey Trio, which covers his free jazz materials, the Black Rock Trio, and Memphis Blood featuring Vernon Reid. "The most original guitarist since Jimi Hendrix." "Most important guitarist since Wes Montgomery." 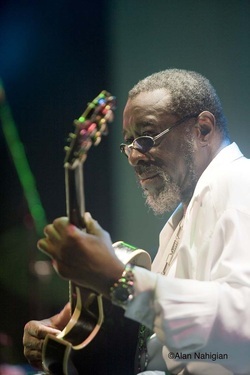 "James “Blood” Ulmer is a wildly original guitar hero." "One of the best guitar players I´ve ever heard."